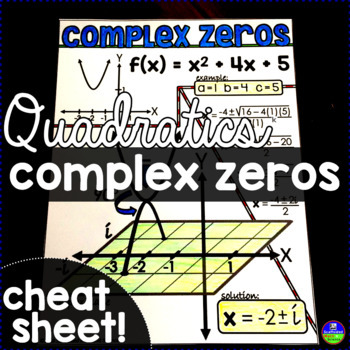 This reference sheet for complex solutions in quadratics is helpful for showing students what these nonreal solutions look like when graphed. 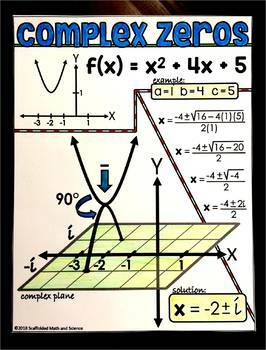 An example is given of a quadratic that is solved with the Quadratic Formula to find 2 complex solutions. The complex zeros are shown on the complex plane by flipping the parabola upside down and turning it 90 degrees. Students can color the reference sheet to personalize it for their notebook or binders. The sheet can also be enlarged into a poster as an anchor chart for graphing logs. I love giving my students reference sheets when we are first learning topics and to reference throughout our units. Having access to the information they need seems to give my students a nice boost of confidence that helps them push through difficult topics.